State to demolish farm that supports Jewish family of 12. Neighbor: Decision based on lies. The state has decided to demolish a Jewish-owned farm in the Judean hills owned by Mordechai Deutsch. The Deutsch family farm is the sole source of food and income for Mordechai, his wife and their 10 children. Mordechai’s brother Yeshayahu Deutsch, also a farmer, was murdered by a terrorist at his farm in Gush Katif. 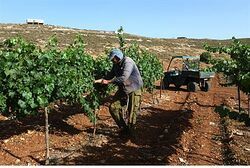 State representatives announced that the farm would be demolished after a Palestinian Authority Arab family filed a petition to the Supreme Court. The Arab plaintiffs accused Deutsch of burning Arab property in their appeal to the Supreme Court, but had never filed a police complaint over the alleged offenses – which, Deutsch said, never occurred. “It’s all tall tales and stories with zero connection to the truth, and the court accepted it,” Ofir concluded. The story, as related by Ofir, is reminiscent of the legal troubles facing Migron. The Jewish community of Migron, like the Deutsch family farm, stood for many years before suddenly facing a lawsuit from PA Arabs. The Arab plaintiffs similarly brought their accusations straight to the Supreme Court, without filing complaints with police. Justice Ministry officials told Arutz Sheva that the Supreme Court had ruled structures at the farm to be illegal, stating that even makeshift greenhouses require a building permit. The demolition order remains in force, they said.